Relate: It was two weeks before Easter 2015. I was standing at the front of a movie theater looking up into a blindingly bright spotlight and about two hundred people behind it. This was to be my last sermon in America before heading off to Turkey. A few days later I would be getting on a plane heading for Istanbul. In the wee hours of Palm Sunday, after plenty of delays, a missed transfer, and an overnight stay at the airport in Moscow, I would be touching down. That means that Easter Sunday, the biggest Sunday of the year, was the first chance I had to understand just how much my world had changed. As a side note, that message titled Rebuilding the Walls is available online but I am not going to help you find it since there is a bit more of me (about 25-30 lbs more) than I care to show. I had no idea then how much work Turkey would be. I had no idea how much blood sweat and tears were to be invested. I had no idea how many kids and people I would fall in love with. I had no idea what getting a body (especially the innards) adjusted to a new environment would do to me. (We will not talk here about that ruined pair of pants) I had no idea what would be running through my mind as I was being questioned not too kindly by one policeman as another was deleting all the pictures from my phone. (BTW, some of the pictures from that same time and place they didn’t get their hands on will make it into the worship video below.) Most of all, I had no idea how God would prove Himself faithful and true and real in my life and the lives of those I communicate with time and time again. 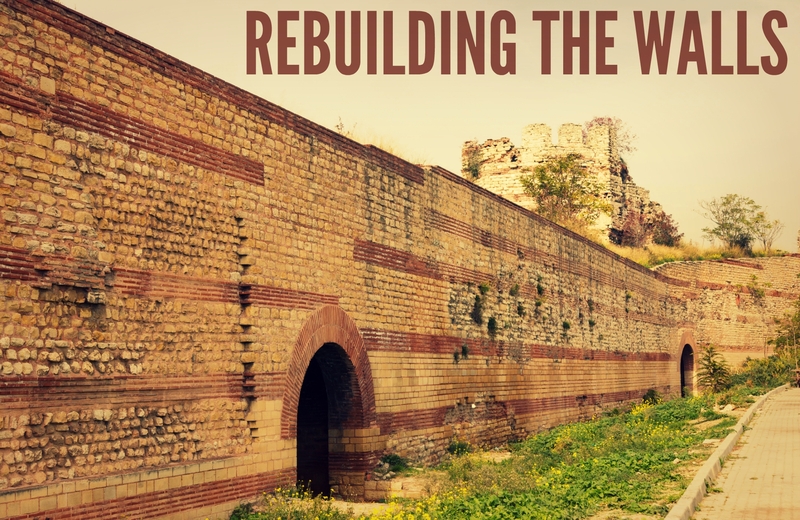 When Nehemiah returned to Jerusalem to begin rebuilding the walls, he had no idea just exactly what he was stepping into. Before leaving he had no idea if the king would even allow him to go. Once he arrived and saw the immensity of the task as well as how the people around had adapted to the status quo, he had no idea how he was to inspire them to become a team of wall builders. He had no idea how jealous the local petty bureaucrats would be and how much opposition they would throw up at what they saw as a challenge to their petty influence. He had no idea that the local rich capitalists (the one percenters) would work directly against him using their economic power to reenslave the people he had worked so hard and sacrificed so much to buy free. React: In between the songs of an old Kirk Franklin album a random guy tries to give the artist some advice. He says, “If at first you don’t succeed, give up and try something else.” I have heard many variations of similar bad advice wrapped up in spiritual sounding metaphors like: “Just keep knocking on doors until you find the one God has opened.” People have said things like, “If you keep facing all these complications, it is probably God trying to tell you that you aren’t moving in the right direction.” Most commonly I have heard, “God won’t give you more than you can handle.” Most of the others I would just fob off as bad advice. That last one is a lie straight from the pit of hell. David couldn’t “handle” Goliath. Moses couldn’t “handle” Pharaoh’s army and the Red Sea. Joshua couldn’t “handle” the walls of Jericho. It is precisely when we are in a situation beyond what we can handle that He best is able to prove that He is God. If obstacles and complications keep coming up in your life, it is probably proof that you are moving in the right direction. Satan won’t oppose those who are no threat. God won’t provide miracles that are not needed. If your heart is in the right place but your feet are moving in the wrong direction God is more than able to reveal to you His will in other ways than throwing up obstacles in your path. So go right on up to that door God has called you to. Knock. If it doesn’t open, keep on knocking. If there is still no answer, kick it down. If you walk through that broken door only to find another in your way, repeat the process. Than again… and again. Keep on kicking until that house is yours. The timid and the lazy will have no part in rebuilding walls and restoring ruins. You have not called us to an easy life. You haven’t called us to a comfortable or simple life. Thank you for that. Easy, comfortable, and simple are far too boring a way to live. You have called us to life more abundant. That means the challenges are going to seem insurmountable, the opposition more immense, and the valleys deeper. But it also means the victories will be that much sweeter and the mountaintops… beyond anything an easy life could have imagined. Give me a higher calling, Lord. Then give me the fortitude to walk it all the way to victory. I enjoyed reading this post! I like what you said about “God won’t give you more than you can handle” being a lie. People often use I Corinthians 10:13 to back up the lie, yet that scripture is specifically talking about the Greek word pelagos, which refers to a deep or open sea or a depth (like a pit?) and that He will always provide a way out. That tells me the obstacles, the pits, the whatever that is preventing somebody from doing what God has told them to do does not come from God. Otherwise, He would not provide a way out. The obstacles, or hindrances, come from the enemy who wants to resist us and prevent us from fulfilling what God has called us to do! Thank you so much; your words have greatly encouraged me! Thank you – relentlessly pursuing Christ. Thank you and may the lord Jesus Christ magnify your ministry. Preserve and protect Your servant oh Lord, in Jesus Mighty Name. Amen. This is a great reflection on a too-familiar attitude. Thanks for sharing it so well! Love this! What a great example of God’s Mighty Hand & Power…when we just believe and leave the results to Him. Thanks. This is so moving and so encouraging, thank you! May the Lord bless you! I will follow this up soon with another comment and you will see why this is so relevant to me. Great post! Believers need encouraged to have a bit of grit and keep pressing on into what God has called them to do! How challenging the adventures with God! It’s about Him not us. So lead on Lord, as we follow – trusting, obedient step by step, till life like the walls is complete. Over the walls into Your safe abode. Glory! That’s a very strong and powerful message and I agree with most of it. Except that God will actually never give you more than you can handle. David did handle Goliath, Moses showed Egypt, Pharoah and his army and Jesus took the cup. Remember, “I can do all things through Christ who strengthens me.” If you can’t handle in your own strength, you always can in His. Sometimes we have to wok hard to get where we want to be, Sometimes we don’t know how we are going to do it, but we have to do it to be part of God;’s plans. No matter how many obstacles we have to go through, if we want God to be there beside us, all we have to do is ask God for his assistance and he will be there. He will never give us anything we can’t handle, but sometimes we have to ask for help to be able to complete his task at hand. This is something I learned the hard way, so now what I do is send a morning offering. I will have that in there in a post later on, so be looking for that. Your loving brother in Christ, Don’t give up when you think you can’t do it, keep right on pushing on, pushing on, pushing on. You will make it through with God by your side. Ask for God’s help! I just met a guy who told me the lie of easy life. It’s amazing how evil men who got no God in them keep telling us that obstacles are from God to lead us to an easy life. “Because wide is the road that leads to perdition and narrow is the path to heaven”, something like that is written in Bible, isn’t it? May God help you in your many obstacles. Thank you for this post. I found it meaningful and helpful. May God continue to bless you and your ministry.